* Minutes of Meeting Produced Under FOIA To DXer Today Report On Experiment Dr. Ivins Was Conducting On Nights The DOJ Speculated, Without Basis, That He Was Making a Dried Powder And DOJ Claimed, Without Basis, That Dr. Ivins Had No Reason To Be In Lab « CASE CLOSED … what really happened in the 2001 anthrax attacks? This entry was posted on August 19, 2011 at 9:17 am	and is filed under Uncategorized. 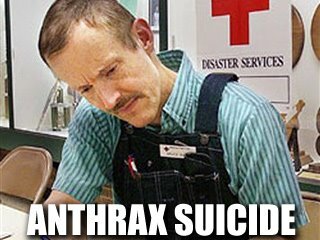 Tagged: *** 2001 anthrax attacks, *** Amerithrax, *** Dr. Bruce Ivins, *** FBI anthrax investigation, Ivins whereabouts on crucial nights, October 11 2001 meeting minutes. You can follow any responses to this entry through the RSS 2.0 feed. You can skip to the end and leave a response. Pinging is currently not allowed. On Friday, October 5, 2001, Dr. Ivins explained that 3 days after a challenge with Ames 12 rabbits had died. is giving us VERY strong evidence that we should incorporate a stabilizer in with rPA and Alhydrogel. maybe we should start thinking about them now. formaldehyde at 0 weeks. Challenge (subcutaneous) at 6 weeks with about 100 LD50 Ames spores. (subcutaneous) at 6 weeks with about 100 LD50 Ames spores. USAMRIID will be releasing an inventory list of what was taken or provided to the FBI. (They are working the redactions). But, as a cross-check, you should make sure that the FBI gave you everything that they got from USAMRIID. 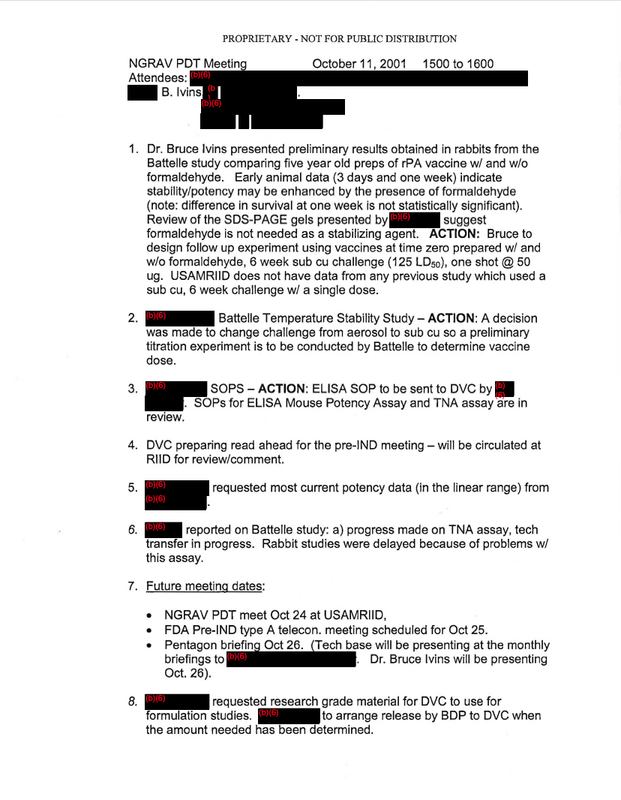 Here is an October 2001 Battelle report on inhalation lethal dose in rhesus monkeys. Lots more to come. (My FOIA request was for documents from Bruce Ivins office from September and October 2001). With respect to the challenge that Battelle was using in June 2001, that I understand to have been Ames, it appears that it was “weaponized”, to borrow the report’s phrase. The typos are mine. This page is found in part 3 of the segments uploaded. distress is followed by shock and death, with close to 100% mortality. indicated a degree of concern in the accuracy of the previous data, and this work will provide confirmation of that data. Here are some lab notes from the nights in question. The FBI is withholding numerous additional lab notebook pages from September and October 2001. The GAO should obtain them and cause them to be uploaded.